Italian lightly armed warrior (by Peter Connolly), the main type of lightly armed Italian warriors who attacked Cumae in 524 BC. Especially for the peoples of the Apennines, the central mountain range of the Italian peninsula, this was the main combatant type. These hardy and stubborn warriors, mainly Oscan and Southern Umbrian, caused great problems in Rome in the coming centuries. The depicted warrior has a native Italian helmet with a Greek-type plume. He bears a protection plate on his neck and a pactorale – a circular disk to protect his chest. He holds two spears – one heavier and one lighter. He also has a Greek-type sword (copyright: Peter Connolly). In 745 BC, the Euboean Greek settlers who had colonized years ago, the small island Pithekousai off coast of the Bay of Naples in Italy, founded Cumae (Cyme in Greek, Cumae in Latin) on the opposite coast. Cumae was the first ‘official’ Greek colony in the Italian peninsula. Pithekousai was actually the first, but ‘unofficial’ colony in Italy. Cumae took its name from the Euboean Cyme, rather as a neutral compromise between Chalkidean and Eretrian settlers, the most numerous among the Euboeans. Chalkis and Eretria were the most powerful city-states of the large island Euboea in the Aegean Sea. Soon Cumae, enhanced by new colonists from Chalcis, Eretria, the Euboean Cyme, Tanagra (Boeotia), Cirinthos (Euboea) and Oropia (Boeotia), expanded in the fertile land of the Phlegraian Fields to the north. Later, further more Greek colonists arrived in Cumae from Magna Graecia, Samos etc. founding subsidiary colonies and thereby increasing the extent of the Cumaean territory. Among the Cumaean colonies, Neapolis (modern Naples) would become the most important. In other cases, the Greeks settled in existing villages o f the indigenous Ausones, turning them into Greek colonies, as it happened in Pompeii, Heraklion (Herculaneum), etc. Thus the boundaries of the Cumaean territory were approaching fast the river Volturnus, but soon they were confined by a powerful enemy: the Etruscans (or Tyrrhenians as the Greeks used to call them), the people of Etruria (modern Tuscany), mostly of Anatolian origins (from Lydia, Asia Minor). The competition between the Greeks and the Etruscans was older enough. The mythographer Palaifatos (“On Unbelievers”) assures that the sea monster Scylla, which Odysseus encountered on his wanderings (“Odyssey”), represented the danger facing the Greek merchant ships in the Strait of Messina, from the Etruscan pirates. 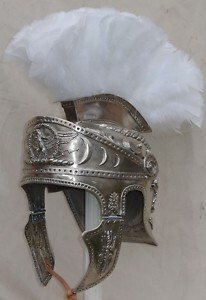 An Osco-Attic helmet of the Lucanians with many characteristic Oscan novelties. 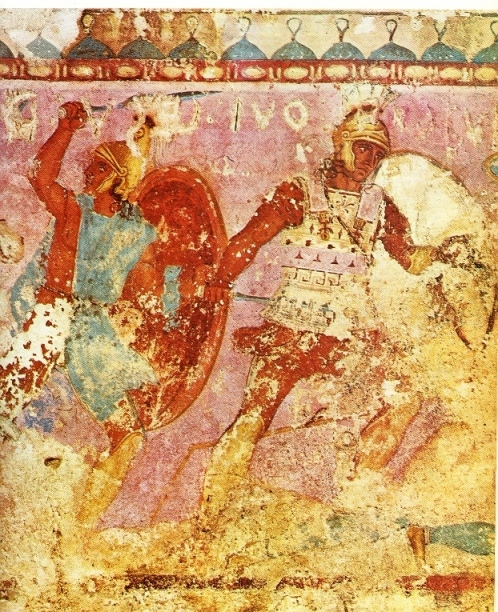 Etruscan hoplites of Tarquinia with Greek arms and armour, 4th century BC. The hoplite on the right wears a proper Attic helmet. The left one wears a mixed Phrygo-Attic helmet. 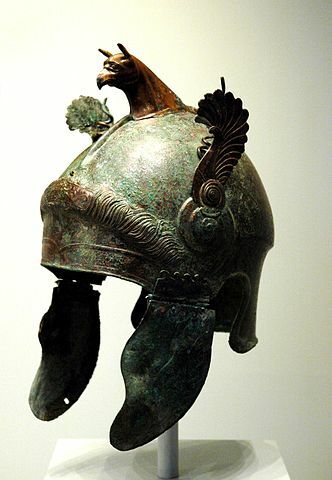 The peoples of ancient Italy, firstly the Etruscans and the Iapyges (later known as ‘Apulians’), used almost all types of the Archaic, Classical and Hellenistic Greek helmets: the Corinthian, the Chalkidean, the Attic (Athenian), the Boeotian (for the cavalry) and later the Thracian, the Phrygian and all the Hellenistic types. They had particular preference for the first three types. In this article, I will deal specifically with two types of helmets in Italy which originated from the evolution of the original Greek respective ones: the Italo-Corinthian and the Italo-Attic or Osco-Attic helmet (in fact, the Osco-Attic is the main variety of the Italo-Attic group of helmets). The Italo-Corinthian helmet (also known as Pseudo-Corinthian, Apulo-Corinthian or Etrusco-Corinthian ) was born out of the habit of the warriors of Italy to wear their Corinthian helmet raised, even when the battle began. Because of this, the protective visor gradually evolved into a decorative ‘pseudo-visor’ while the helmet was manufactured in a manner that did not cover the face anymore. In the later centuries, Attic-type cheek-protectors were added in it.